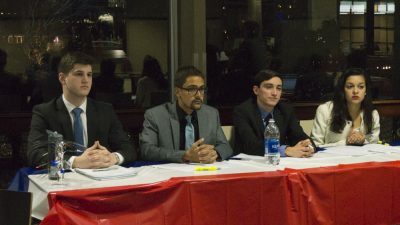 With Boston University Student Government elections on the horizon, the Student Election Commission held a press conference Thursday night for the two slates, BUnited and Build BU, to speak about their goals for the next year, if elected. Attendance at the conference was low, with two students and six senators present in addition to the two slates. SEC co-chairs Vincent D’Amato and Ria Wang introduced the slates. BUnited spoke first, outlining their plan to use SG’s resources to hold more academic events for students. Members of the slate specifically mentioned their ideas to increase the number of speakers brought to campus and to hold multiple career fairs. BUnited executive vice-presidential nominee Alexander Diaz said BUnited hopes to expand academic resources, specifically by increasing Mugar Memorial Library open hours during finals. Diaz said BUnited will work to extend this plan to the Fitness and Recreation Center and the dining halls. BUnited presidential nominee Kenneth Delatorre said his slate will, if elected, increase transparency between the executive board and Senate, as well as between Senate and the student body. Delatorre said improved transparency could be accomplished by allowing Senate members into closed e-board meetings, as well as meetings with the administration. He said he also wants increased press coverage of SG meetings. Both slates stressed the need for unity on campus, including between students of different colleges. Build BU executive vice-presidential nominee Hafzat Akanni introduced one of Build BU’s principal initiatives, titled “A Seat at the Table.” The initiative is meant to provide a way to better represent BU’s diverse student body. “We are a university that prides itself on the diversity here, but not all the time are all the different diverse students from all walks of life represented,” Akanni told The Daily Free Press before the press conference. Build BU presidential nominee Devin Harvin said his slate is different from previous slates in the excitement it brings to SG. Build BU took time to explain the rationale behind their three campaign pillars: classroom, culture and communication. The “classroom” pillar involves the zero-cost textbook initiative: a proposal to make class materials free to BU students. Harvin stressed that even with financial aid, it is important to consider the extra cost of attendance to students. The “culture” pillar refers to measures the slate wants to take to enhance school spirit, and the “communication” pillar aims to increase SG’s outreach to student groups. Hafzat said her slate’s previous experience with student groups gives them a particular advantage when it comes to outreach. Two of Build BU’s members, Lovie Burleson and Hector Meneses, were absent for the press conference. Emmanuel Reid, a sophomore in the College of General Studies, said he was unfamiliar with the SG election before the press conference. Reid said he is undecided on which slate he will vote for next week. Luis Castro, a senior in the College of Communication, is volunteering for Build BU, helping them with media relations. He said he saw improvement in the way the two slates expressed their ideas at the press conference, compared to their performance at the debate earlier in the week. CORRECTION: A previous version of the article stated that the two students in attendance were independent. In fact, one of them, Luis Castro, is a volunteer with Build BU, helping them with media relations. His role in their campaign has been clarified.